My body has been tortured lately by all sorts of foreign chemicals. It started with a reaction to a topical drug, and it has finished (hopefully) with a reaction to a new bed. In both cases, my body violently and dangerously responded to chemicals that it deemed unsafe and unnatural (hence, "foreign"). In my effort to heal, I have researched a lot about toxins in the home, and new beds are a huge offender of bringing in toxins. One way to help eliminate toxins in the home is to open windows and let outdoor air inside. 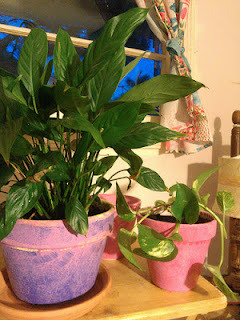 Another way to help clear the air is to have lots of house plants. I have sporadically been opening the windows in the house for the past few months, even with very cold weather! Today, I went and bought new houseplants that research shows effectively clears the air. In 1989, NASA performed a house plant study: Interior Landscape Plants for Indoor Air Pollution Abatement. Basically, they were trying to figure out how to keep the space station air clean, and they hypothesized that house plants could remove major toxins. The toxins they studied were trichloroethylene, benzene, and formaldehyde, and they discovered that certain plants did better than others at cleaning the air. However, when you look at the findings, you can see that most all plants did help to clean the air.